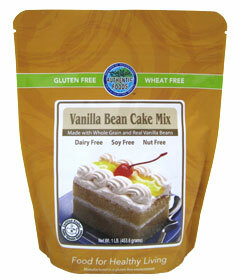 The Authentic Foods Vanilla Bean Cake Mix creates a vanilla cake unlike any other that you’ve tasted in a long time. It’s so good, you’ll have your whole family asking for more! The best part is that it is very easy to make. All you need to add is eggs, milk (or a non-dairy substitute) and softened butter or substitute. 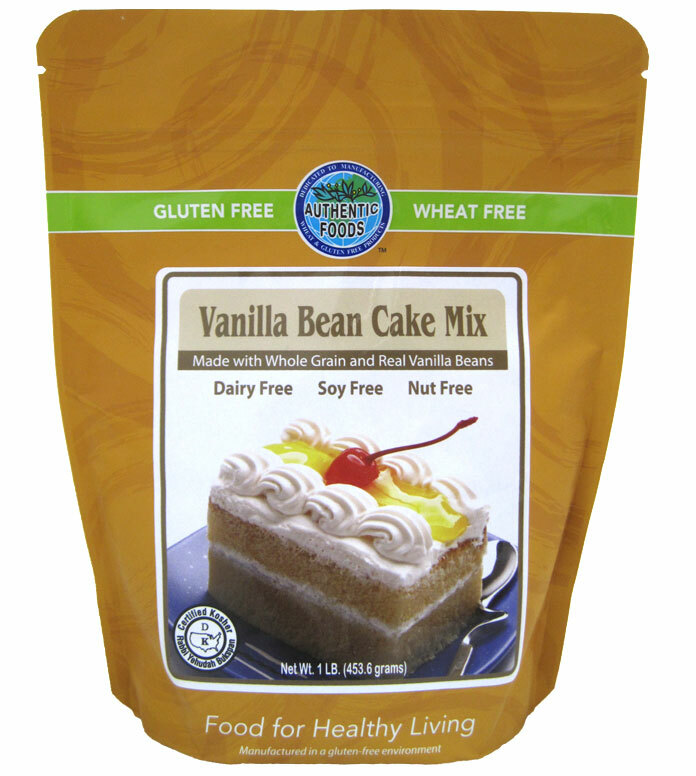 This cake mix is all natural, GMO-free and versatile. It can be used to make a variety of baked goods, including classic vanilla cakes, spice cakes, cupcakes, apple cakes, Boston Cream Cakes, white chocolate chip cakes and much more. This mix makes a one layer cake. Ingredients: Cane Sugar, rice flour, tapioca flour, potato, plant fiber, vanilla flavor, non-iodized salt, leavening (monocalcium phosphate, monohydrate), baking soda. Preheat oven to 350 degrees F. Lightly grease the inside of a 9-inch round cake pan. 1. In a bowl, combine the eggs and milk and beat until well blended. 2. In a separate bowl, blend the cake mix and butter with an electric mixer. Add half of the egg mixture and blend evenly at low speed. Add the remaining egg mixture and blend until smooth and light. Blueberry-Vanilla Muffins Follow the recipe above but subtract 2 tablespoons of the egg-milk mixture and fold in 1/2 cup fresh or frozen blueberries. Spoon into a greased or lined muffin pan and bake for 20 to 25 minutes. Makes 16.